Our sandalwood, glycerine based, soft shaving cream in a traditional, metal, travel tube. 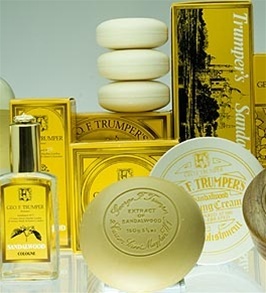 Trumper's lightly fragranced sandalwood shaving cream is suitable for sensitive skin. Glycerine based, sandalwood soft shaving cream in a screw thread pot. Just a small amount produces vast quantities of rich lather. Our glycerine based hard shaving soap refill for our wooden shaving bowls, with an invigorating coconut oil fragrance.